It was called a telescope. And it changed the world. Like the device itself, Galileo's telescope (which he created based only on a description of the Dutch original) brought into sharp focus an entirely new perspective on what's happening beyond our eyes. And that meant we had to change our thinking. You assemble a tube or pipe with two glass lenses in it — one lens convex (outward curved), and the other lens concave (inward curved). By placing the two lenses the right distance apart, you could look through the tube and see a distant object magnified. With those distant objects appearing much closer, you could see detail that wasn't visible with the naked eye. Galileo's first telescope made objects three times larger. New designs made objects eight times larger. Eventually, his telescopes made objects thirty times larger. Distant objects looked close enough to touch. Today, it's difficult to appreciate how radical this shift in perspective really was. We've had the ability to magnify distant objects our whole lives. But in Galileo's time, before the invention of the telescope, the total distance you could see was limited by the strength of your eyes. And the effect of this simple invention was extraordinary. Galileo was a scientist and philosopher. So it was only natural that he'd point his telescope to the stars. He began mapping the surface of the Moon, looking at the stars in the distance, and even discovering the four moons of Jupiter. He used his observations to support the theories of Nicolaus Copernicus, whose calculations some 60 years earlier had showed that the planets orbited around the Sun. Back then, people believed the Earth was at the center of the universe. By offering better detail of the Solar System and our galaxy, Galileo offered evidence that Copernicus was right. Because suddenly, the order of magnitude of our vision changed. We went from being the center of the universe, to sitting on a rock circling a star. And some people didn't like that idea. When Copernicus presented his heliocentric theory in 1543 (the year of his death), it didn't cause much of a stir, even though it went directly against the beliefs of the Roman Catholic church. But when Galileo's telescopes began to demonstrate the ideas that Copernicus theorized, that suddenly changed everything. The idea that the Earth revolved around the Sun went against the Catholic Church's interpretation of the Scriptures. So they decided Galileo's work was blasphemous. The Church condemned the work of both Copernicus and Galileo, and Galileo was put on trial. He was forced to recant his statements, and he spent the rest of his life under house arrest by the Church. But the Church was only doing what most of us do when we're presented with ideas that challenge our accepted truths. They hung on to what they believed, rather than adapting to this new knowledge. It took nearly 400 years for the Church to admit that Galileo was right — when Pope John Paul II in 1992 expressed regret at how Galileo was treated, and officially recognized that the Earth revolves around the Sun. Imagine that: denying for 400 years something that Galileo's invention could help you see with your own eyes. 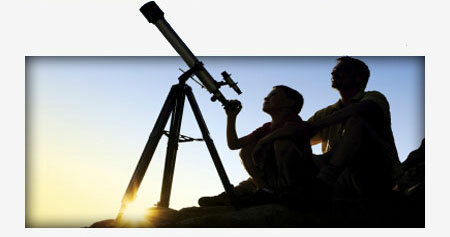 The telescope is a great metaphor for the forward progress of humanity. It was a new technology — conceived, invented, and designed by the mind of man — that radically transformed our ability to perceive and understand the world we live in. It pushed us forward exponentially, and opened up whole new areas of thinking. Ideas spark ideas. And here was tool that sparked a new universe of ideas. We can solve any puzzle with sufficient time and information. This combination is what makes human beings phenomenal. Galileo, upon hearing about the telescope, imagined it. He then used his brain to solve the puzzle of creating it. And in the process, his idea sparked the imagination of millions of people across the globe. His ideas will continue to spark the imagination of perhaps every conscious being to come. And this is the phenomenal power of the human mind. Our ongoing pursuit of knowledge is built into our DNA. Human beings will always look beyond where we are today. All the knowledge we have, and all the extraordinary new discoveries, theories, and technologies that we're discovering now — today — on an almost daily basis will always lead to an expanded imagination. We will always invent new "telescopes" to see beyond what we know. Galileo's telescope is a symbol of humanity. Which is why today, on the 400th anniversary of his introduction of this exceptional tool to the Venetian Senate, we would be wise to consider the story of Galileo. He continually pushed forward in his pursuit of knowledge. He created unique contributions that empowered the world. And even in the face of extreme opposition, he continued to do what he loved. He was genuinely living the phenomenal experience. But the true value of Galileo's experience goes beyond even that. No matter how certain we are of what we think we know, we will always develop new tools to see further than we can see today. As a result, we must always be open to seeing our world in a whole new way we've never known before. The Church isn't the bad guy in this story. The Church simply clung to outmoded ideas because the new ideas challenged everything they believed. Similarly, as we look at some of the remarkable world-changing technology that's being created and designed today — whether it be cloning or genetic engineering or virtual reality or emerging technologies like cellular regeneration or nanotechnologies — we must be open to ideas. Much of what's coming will challenge everything you think you understand about your world. Much of what's coming is going to radically change the entire human experience. This is not a bad thing. We will see more than we see today. And that inspires more imagination. And that expands the reach and breadth of the human experience. With Galileo's telescope, we can see more than stars. He helped us see something profound and new, and it challenged our preconceived ideas. And that resonates with me, because Phenomenal and The Phenomenal Experience are like a telescope for your mind. They, too, will help you see something new — a new way of seeing your world that will push you forward in extraordinary new directions. Never be afraid of forward progress. Humanity naturally expands our own ideas. New information sparks new knowledge which sparks new imagination. We will always move forward. Tomorrow will always be different than yesterday. Galileo gave the world a gift of extraordinary magnitude. He gave us tool to move us forward. That was his phenomenal experience. You have a phenomenal contribution within you, as well. Are you tapping into it, and sharing it with the world? Will we celebrate your contribution 400 years from now? This information was the best that I could find on the internet. I got alot of information for my project. Thankyou so much for posting this! It helped alot!